The Blue Shirts were bulldozed by the Green Shirts in the first two One Day Internationals of the series which were played at Chennai and Kolkata on December 30, 2012, and January 3, 2013, respectively. The hosts won the last encounter by a close margin of 10 runs on January 6, 2013, at Delhi. The home side regrouped themselves against the visiting Englishmen and clinched the five match ODI series 3-2. 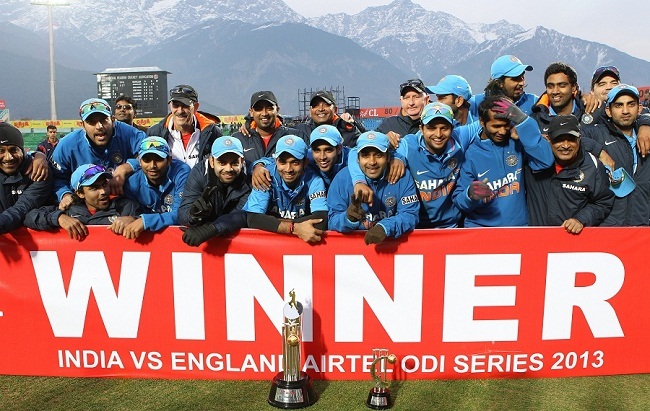 We will highlight the performance of India and England in the recently concluded five match ODI series. 1 – Played on January 11, 2013, at Saurashtra Cricket Association Stadium, Rajkot. Result – England won by 9 runs. 2 -Played at Nehru Stadium, Kochi, on January 15, 2013. Result – India won by 127 runs. 3- Played at JSCA International Stadium Complex, Ranchi, on January 19, 2013. 4- Played at Punjab Cricket Association Stadium, Mohali, Chandigarh, on January 23, 2013. 5- Played on January 27, 2013, at Himachal Pradesh Cricket Association Stadium, Dharamsala. Series result – India won the series 3-2.